In a detention hearing Thursday, U.S. Magistrate Judge Charles Day ordered Hasson held without bond at the prosecution's request. However, Day gave the government 14 days to present more serious charges against Hasson. If it fails to do so, Day said he would entertain a defense motion for release. Hasson faces a misdemeanor drug charge and a felony weapons possession charge related to illegal drug use. Court documents indicate Hasson espoused extremist and white supremacist views for years — aspiring to establish a "white homeland" — and say he is a "domestic terrorist bent on committing acts dangerous to human life that are intended to affect government conduct." "I am dreaming of a way to kill every last person on earth," Hasson wrote in a draft email dated June 2, 2017, that was uncovered by investigators, according to the court records. Throughout the email, addressed to "friends ... Acquaintances more likely," he contemplates the most effective methods to "cause complete destruction" by unleashing a biological attack on the public, followed by contamination of food supplies. "Much blood will have to be spilled to get whitey off the couch. ... They will die as will the traitors who actively work toward our demise," he wrote disdainfully. The rambling and inchoate letter also includes a to-do list for the next four years, revealing Hasson's desire to "Get out of debt!!!! Buy van to convert, diesel, Buy land for family out west or possibly NC mtns." He also adds that he needs to "come off" tramadol, a narcotic painkiller. "Clear my head," he says. Officials arrested Hasson last Friday. In recent years, the government contends, Hasson has been on a weapons buying spree, collecting 15 firearms and more than 1,000 rounds of mixed ammunition — all of which were confiscated from Hasson's basement apartment last week. During the raid, officials also discovered Hasson's computer, containing a spreadsheet that reportedly is a hit list of possible targets — high-ranking current and former Democratic politicians, activists, political organizations and media personalities. In addition to Pelosi, Hasson was allegedly considering some type of violent assault on Senate Minority Leader Chuck Schumer, Sens. Elizabeth Warren, Kamala Harris, Kirsten Gillibrand and Richard Blumenthal, along with U.S. Reps. Alexandria Ocasio-Cortez and Maxine Waters and former House member, Beto O'Rourke. The spreadsheet list also included MSNBC hosts Chris Hayes and Joe Scarborough, as well as Don Lemon and Van Jones from CNN. The court filings paint a picture of an angry and drugged man who has been seeking answers in neo-fascist and neo-Nazi literature for decades and who is desperate to make a "lasting impression on this world." Apparently, Hasson frequently sought instruction from a manifesto written by Anders Breivik, a far-right, anti-Muslim Norwegian nationalist who was convicted in 2012 of two terror attacks that killed 77 people. According to officials, Hasson used Breivik's methods to hone his list of potential victims, conducting Internet searches for "most liberal senators", "where do most senators live in dc" and "are supreme court justices protected." Hasson's drug use also appears to stem from directions in Breivik's manifesto, "taking narcotics in order to increase his ability to conduct attacks." The documents state that when agents searched his apartment, they found documentation indicating Hasson ordered "at least 4,200 Tramadol 100 mg pills" since 2016. In searching his workspace, officials said they discovered at least 100 pills of the synthetic opioid and a locked container, filled with more than 30 bottles labeled as human growth hormone, prosecutors wrote. Hasson has been working at the U.S. Coast Guard headquarters in Washington, D.C., since 2016. He was an active duty member at the time he was arrested. Prior to that, he served in the U.S. Marine Corps from 1988 to 1993 after which he joined the Army National Guard for about two years. 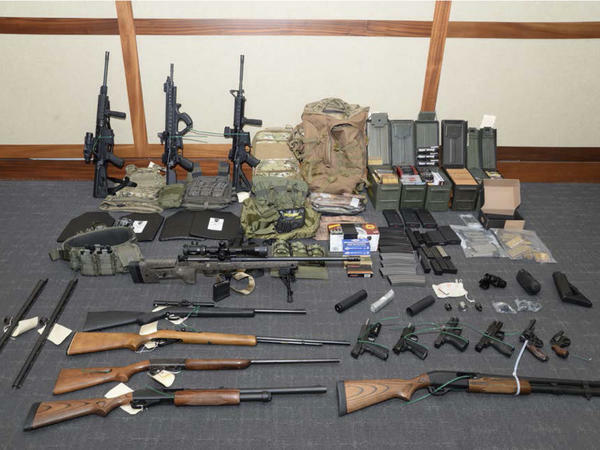 "An active duty Coast Guard member, stationed at Coast Guard Headquarters in Washington, DC, was arrested last week on illegal weapons and drug charges as a result of an ongoing investigation led by the Coast Guard Investigative Service, in cooperation with the FBI and Department of Justice," Coast Guard spokesman Barry Lane told NPR in an emailed statement.